Louis Vierne - Blind French Organist/Composer! Topic: Louis Vierne - Blind French Organist/Composer! Re: Louis Vierne - Blind French Organist/Composer! 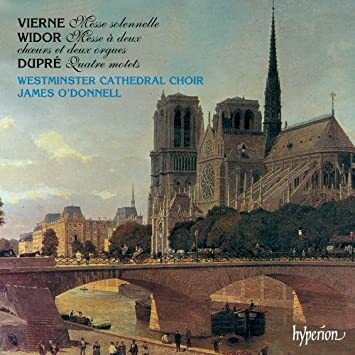 Louis Vierne's Messe Sollennelle plus works by Widor and Marcel Dupre'! Just like Pierné, Koechlin, Tournemire, Roussel, Schmitt, there is nothing in Vierne's chamber music that will stop the trains and make one shout 'Bravo!'. But their tentacles make their way and grab the attention over time. 1890-1950 was a great period for french chamber music. I can't speak for Vierne, but surely Schmitt's Piano Quintet is a masterwork? The Piano Quintet in C minor is his MASTERPIECE (along with his Symphony in A minor). The intensity level of the Quintet is comparable to the Tchaikovsky's Piano Trio or the Chausson's Concert for piano, violin and string quartet. It's stormy, passionate, quite afflicted. I like it more than the Franck's Piano Quintet.